The calories in french fries depend on how they are prepared. A medium, 4.7 ounce serving of french fries will typically contain about 427 calories. Calorie counts in french fries vary. 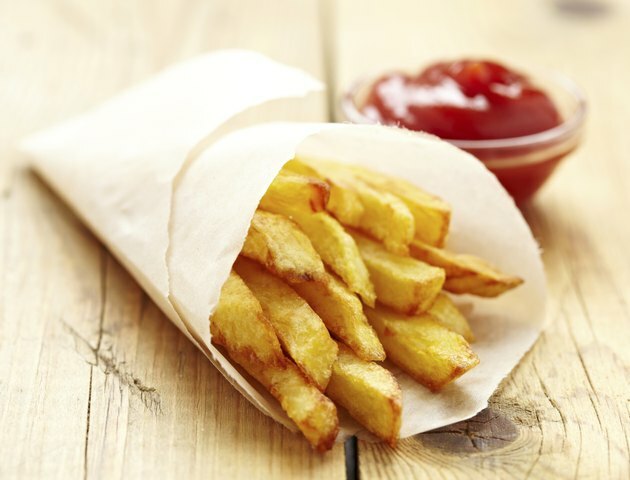 Restaurant versions typically range from around 300 to 400 calories per 4 ounce If you bake fries at home, a 4 ounce serving may have less than 200 calories. Proper portion size for french fries is 2.4 ounce ., or 20 shoestring fries, while most restaurants serve around 6.9 ounce , or 50 shoestring fries, according to the Philadelphia Dietetic Association. Many types of fries are high in total fat, saturated fat and sodium. Read nutrition labels or visit the nutrition section of restaurant websites to find out the nutritional value of your food. For the healthiest fries, make oven-baked fries at home. If you're watching your weight, choose a baked potato, steamed vegetables or a side salad instead of french fries. If you do order fries, skip the chili, cheese, bacon and ranch dressing to save calories. Order a child-size version to reduce calories even further. Don't sprinkle your fries with salt.